Glaucoma is a complex disease with uncertainty as to what actually causes it. It’s no wonder why so much time is spent helping patients understand the disease. What is glaucoma? Simply put, glaucoma is an optic neuropathy (I know...bear with me). Optic – relating to the eye or vision, and neuropathy – damage to a nerve. Putting it together, glaucoma involves damage to the optic nerve, the cable system that runs from the eye to the brain. 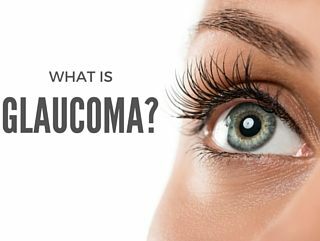 By the time glaucoma has progressed to vision loss, over 50% of the optic nerve can be damaged. Loss of peripheral (side) vision is most common and is often undetectable by patients until it becomes severe. VISION LOSS FROM GLAUCOMA IS IRREVSIBLE. This is an importance concept to understand, as we can only slow or prevent further progression of vision loss but cannot fix the optic nerve or regain any vision loss. It is also important to understand that glaucoma is treated, not cured. Almost all treatments revolve around lowering intraocular pressure (IOP), or pressure inside the eye. Like air in a balloon or blood pressure in our bodies, eyes have an internal pressure as well. Did you know fluid is constantly being made and put into the eye at the same time fluid is constantly being drained into an outflow system to leave the eye? Glaucoma can be diagnosed in patients with a variety of pressures, with a higher risk mostly (but not always!) at higher pressures. We treat glaucoma by lowering IOP, which often slows or halts glaucoma progression. Interestingly, there is no specific number or pressure that works for every patient. However, we do know that pressure needs to be consistently lowered for treatment to be effective, similar to high blood pressure medication (take your pill and the blood pressure is lowered, don’t take it and up the pressure goes). As eye care providers, we are constantly assessing the optic nerve, IOP, and visual function at follow up appointments to assess for progression of glaucoma. We are all individuals and treatments should be personalized, not generalized! To lower the IOP, there are a variety of treatments currently availabe. Often, patients are started on an eye drop to use daily. Laser treatment and surgery can also be used to lower IOP. A newer option for glaucoma treatment is MIGS. No, this is not a MiG-28 (the Soviet fighter jet referenced in Top Gun). MIGS stands for MicroInvasive Glaucoma Surgery. This is a hot topic in eye care and there are a number of options currently available. Most commonly, a MIGS procedure is combined and used at the time of cataract surgery. This can be a tremendously effective treatment for patients and can limit dependency on eye drops, or even eliminate the need for them at all! With no cure for glaucoma on the horizon, glaucoma advancements are critical for addressing current challenges with glaucoma treatments. Eye Surgeons of Indiana offers nearly all currently available options to treat glaucoma and will continue to offer additional treatments as they develop.